Question: What are your day-to-day functions on the job? Bobby: My group works specifically with construction contractors, mainly working on publicly-funded projects; however, we have expanded our reach into private work based on the stability of the project owner. My manager duties include reviewing client specific tasks and prioritizing weekly group goals. Quarterly group reviews allow individuals inside RMS to help set personal educational goals and professional milestones to strive to attain over the course of the year. My position also requires me to promote our services as an exhibitor at various national trade conferences (AGC/CFMA/Con Expo) with a very talented and knowledgeable company VP for Construction Sales and personal Mentor – Earl Harper. Bobby: I live and work just south of Boston, MA. My RMS office is in a small town called Mansfield. We have group members in Houston and Austin, TX, and our corporate office is in Long Island. My group has a national — and even international — reach. Technology allows us to stay in touch no matter the time zone or location. Question: How did you get into construction factoring? Question: When did you first decide you wanted to work in this industry? Bobby: I have worked within the service industry all my life. After college, I had five years in field service in electronics traveling nationally. I had a 10-year run as an owner and operator of a design build landscape company. I worked for two years in hazmat and a total of 14 years in the construction industry. I have to say this industry sought me out, but it was a natural extension of my construction career. Question: How long have you been working with RMP Capital? Bobby: I started in 2008. Question: What is your most memorable experience on the job? I am a huge sports fan, and I was assigned to lead a team of four to review the punch list for the New England Patriots’ new football stadium in Foxboro, MA. We had a 3-week run and reviewed over 20 thousand items. To get access to areas the regular fan would probably never see was very exciting. 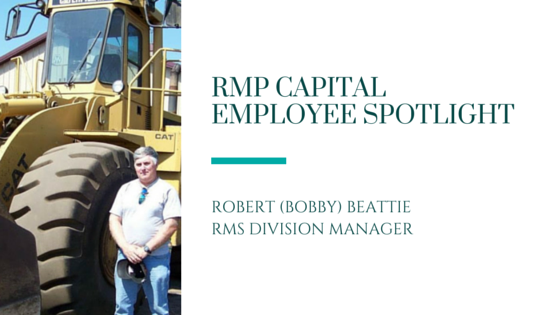 Bobby, we’re so grateful for your contributions to RMP Capital. Thanks for allowing us to get to know you a little better! To meet more of the RMP Capital team, visit our website. Don’t hesitate to call us at 631.738.0047 or reach out on Facebook, Twitter, Google+ and LinkedIn with any questions!